When an island is ‘completely not hit by a tsunami’, a new investigation begins for the daring aquanauts, the Nekton family. Danger, secrets, peril, ancient messages, shocking revelations, and the first word to rhyme with ‘orange’. The Nektons are back, along with Jeffrey the Fish, in an adventure every bit as mysterious as the deep blue sea. This is the 2nd 80-page original graphic novel about this family, I reviewed the first one, HERE BE DRAGONS in my post 13 Comics To Read in 2013 – Chacebook Edition, and I loved that, so I rushed to get this book when I heard about it. But I’d like to stress that you do not need to have read the first book, in order to enjoy the 2nd book. It’s good if you have read it, but it still stands on it’s own as a single story, and you’re quickly caught up to date on whom the characters are. 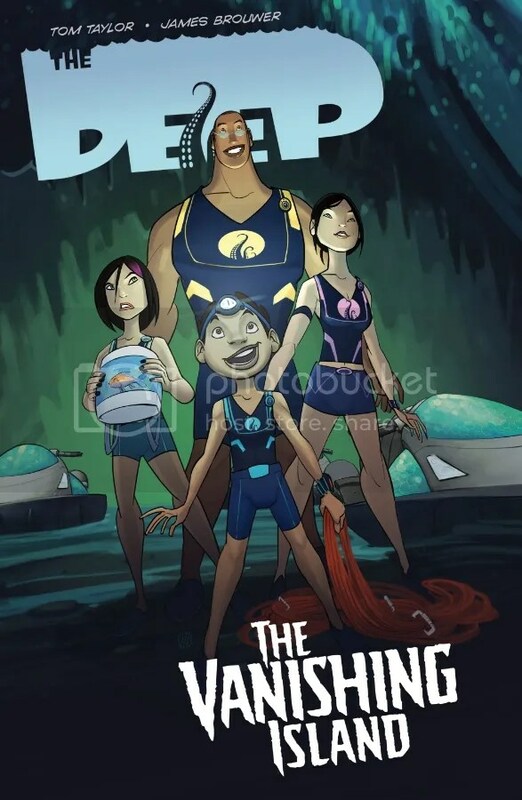 Written by Tom Taylor and drawn (beautifully) by James Brouwer, this is a story about a multiracial/multicutural family (Black/Asian) of ocean explorers. Will Nekton is the patriarch of the family, a former Olympic swimmer turned Oceanographer. Kaiko Nekton is his wife, a lifelong scuba-diver and Marine biologist. Kaiko is the pilot of the Aronnax, the family’s state-of-the art high-tech submarine, which they use to explore the ocean depths. Traveling along with Will and Kaiko are their two children, their teenage daughter Fontaine, and young son Antaeus (nicknamed “Ant”). Both children share their parents’ passion for ocean exploration, with Ant sometimes being a little too enthusiastic, causing him to act without thinking first. In this issue, they’re also joined by an old man named Nereus, who has a mysterious past and doesn’t talk much, but when he does talk, he seems to know more than anyone else. As of this writing, this book appears to be on backorder on Amazon, but is available directly through Gestalt Comics’ website HERE.